Summer is the most fleeting of seasons. All the more reason to embrace annual outdoor festivities. The Red Bull Air Race returns for a second year on the weekend of June 13 and 14 (preliminary weekday practice runs are also popular). The 2009 aerial race is being hosted by the City of Windsor, but both the American and Canadian riverbanks offer prime turf for spectators. Among summer’s longstanding local rites is the 51st Target fireworks display above the river downtown. 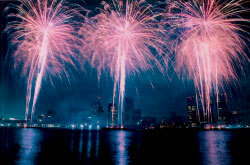 The June 24 pyrotechnics kick off at 10:06 p.m.
Every year, the Detroit Parade Company holds its Official VIP Rooftop Party atop the Miller Parking Garage (next to the GM Renaissance Center). 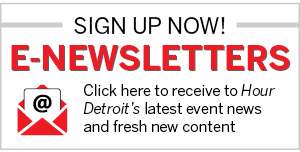 The fundraiser for the Michigan Thanksgiving Parade Foundation offers spectacular viewing, entertainment, food, and activities for children. For tickets ($175), call 313-432-7831.